China has now blocked issuance of a Red Corner Notice against Salafi preacher Zakir Naik who is wanted in India for terrorist activities. NEW DELHI: After repeatedly stalling sanctions against terror group Jaish-e-Mohammad boss Maulana Masood Azhar at the United Nations, China has now blocked issuance of a Red Corner Notice against Salafi preacher Zakir Naik who is wanted in India for terrorist activities. The current President of Interpol is Meng Hongwei, a Chinese and a trusted bureaucrat of Chinese President Xi Jinping who could have been instrumental in blocking the Indian request to the global police body to issue a Red Corner Notice against Naik, top sources in the Interpol said. The current President is also said to be instrumental in the arrest of nearly three dozen Uyghurs wanted in China by the Egyptian authorities. The RCNs against the Uyghurs were issued at the behest of Chinese Government request and Hongwei had also pursued the matter with the Egypt Government for the execution of the RCNs, the sources said. The agencies in India also suspect that Malaysia could also have backed Naik's case before the Interpol. The Malaysian Government suspects that India was instrumental in a pro-democracy movement three years ago in that country which ran counter to the ruling regime. This could also be the reason why Malaysia granted permanent residency to Naik and India is planning to request the Government there for his extradition. 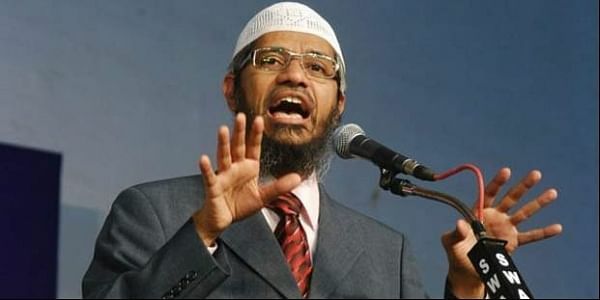 "NIA's request for Red Notice against Zakir Naik was not accepted by Interpol as charge sheet had not been filed when the request was submitted to the Interpol Hqrs. Now NIA will submit a fresh request to Interpol as charge sheet has already been filed in the concerned NIA court in Mumbai," NIA IG and spokesman Alok Mittal said. Naik was declared a Proclaimed Offender in July this year by a Mumbai court and has been chargesheeted by the NIA in connection with a terror case on October 26. The National Investigation Agency (NIA) had filed the charge sheet before the NIA Special Court, Mumbai against Naik for "deliberate and malicious acts" to outrage religious feelings by promoting enmity and hatred between different religious groups in India through his public speeches and lectures besides inciting violence. Besides Naik, the agency has also chargesheeted two entities promoted by him ---Islamic Research Foundation (IRF), Mumbai and Harmony Media Private Limited (HMPL). The chargesheet also hinted that Naik has floated another outfit styled as 'Islamic Dimensions' apparently after IRF was banned by the Centre under the Unlawful Activities (Prevention) Act. "During the investigation, it was found that through his public lectures/speeches, accused Zakir Naik deliberately and maliciously insulted the religious beliefs of Hindus, Christians and non-Wahabi Muslims, particularly Shia, Sufi, and Barelwis, with intention of outraging their religious feelings, and IRF and HMPL have been instrumental in the maximum circulation of such incriminating speeches in the form of CD/DVD/ TV program, " the NIA had alleged in its chargeheet. The chargesheet further said, "The investigation conducted by NIA has firmly established that the incriminating public speeches/utterings have been in circulation through the electronic media, such as CD/DVD and web portals Facebook/ YouTube, etc. ; and have been, and continue to be seen, across the world."